4. 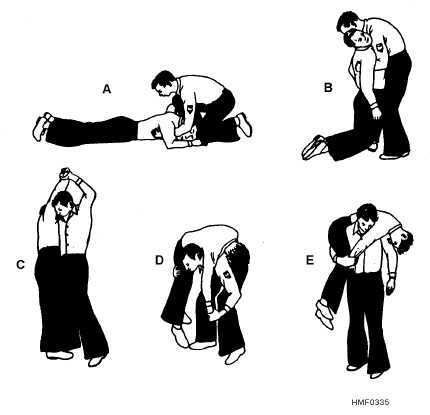 Grasp the casualtys far arm at the wrist and bring it over your upper shoulder as you roll and pull the casualty onto your back. 5. Raise up your knees, holding your free arm for balance and support. Hold both the casualtys wrists close against your chest with your other hand. 6. Lean forward as you rise to your feet, and keep both of your shoulders under the casualtys armpits. Do not attempt to carry a seriously injured person by means of the pack-strap carry, especially if the arms, spine, neck, or ribs are fractured. Arm Carry: The technique for a one-person arm carry is shown in figure 337. 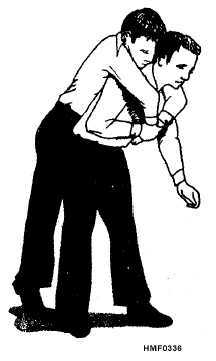 However, you should never try to carry a person who is seriously injured with this method. Unless considerably smaller than you are, you will not be able to carry the casualty very far using this technique. Blanket Drag: The blanket drag, shown in figure 338, can be used to move a person who, due to the severity of the injury, should not be lifted or carried by one person alone. Place the casualty in the supine position on a blanket and pull the blanket along the floor or deck. Always pull the casualty head first, with the head and shoulders slightly raised so that the head will not bump against the deck. 3-22 Figure 335.Firemans carry. Figure 336.Pack-strap carry.